0945hrs Pick up at Tawau Airport. Proceed on 4-wheel drive to the Maliau Basin Security Gate, 180KM away. Weather permitting; journey will take about 5 hours. 2000hrs Weather permitting, go on a night drive in search of nocturnal animals. Possible encounter/sightings of Sambar Deers, Bearded Pigs, Malay Civets, Flying Squirrels and Borneo’s Wild Ox, the Banteng. 2200hrs Settle in for the night. 1430hrs Arrive at the Camel Trophy Camp. Settle in. 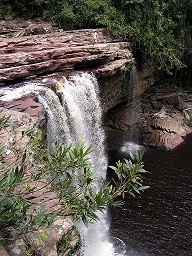 OPTION A: Walk to the Giluk Falls about 1hour away and back to Camel Trophy Camp. A dip in the pool is possible or walk to the spectacular, about 100M in height (10 storey building) Takob-Akob Falls which is about 2hours away and back. OPTION B: Enjoy the surroundings at the Camel Trophy Camp. Have a swim at a nearby stream. 1900hrs Dinner and settle in for the night. 0700hrs After breakfast, trek along the forest making a loop back to the Agathis Camp. 0730hrs After breakfast, drive back to Tawau Airport through the Maliau Basin Security Gate. Guest MUST submit a copy of their latest personal insurance policy that covers emergency Helicopter evacuation. Guest MUST submits their latest certificate confirmed by physician or doctor. Special permission is needed and separate charges are levied for professional photography or filming. Guest is to be accompanied by guide at all times and not allowed to wander on their own. A compass or Global Positioning System (GPS)-Maliau Basin map given upon request.